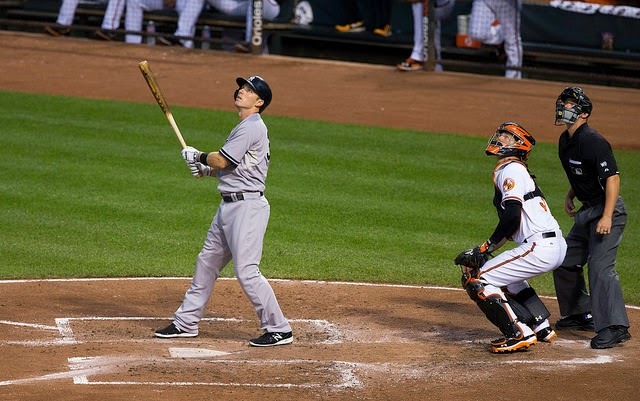 Whether fans like it or not, the New York Yankees will be patient with Stephen Drew. He gave everyone a reason to exhale and deliberate on his status with the club after a pinch-hit grand slam in Monday night’s 6-5 victory over the Baltimore Orioles. Drew is much maligned after putting together what was one of the worst seasons in Major League Baseball history in 2014. He held out for a better contract last offseason after being slapped with a qualifying offer from the Boston Red Sox. Suitors bypassed Drew and eventually he re-signed with Boston and began playing in June. Missing Spring Training was a certain detriment to his offensive skill set and he began losing playing time. Drew was eventually traded to the Yankees and was not given much of a chance to play consistently as his struggles simply moved down the coast. Besides the offensive downturn, Drew was also being asked to play an entirely new position, second base. Drew ended the season with a slash line that could drive a player out of baseball – .162/.267/.299 in 300 plate appearances. But, Drew has a track record, one which does not spell out superstar, but rather maintains respectable offensive numbers for a middle infielder. After the 2013 season, in which Drew was an important component to the Red Sox World Series championship team, the 32-year-old carried a .264/.329/.435 line in just under 4,000 plate appearances. He owned 162-game averages of 17 home runs and 72 RBI. He hit .253/.333/.433 for the Red Sox with 13 homers and 67 RBI in 2013 which is darn close to those averages. Again, these are not spectacular figures but it placed Drew in a small category of shortstops with above-average defensive abilities and a competent bat. With prospect Rob Refsnyder requiring more seasoning at the keystone, the Yankees took a chance and signed Drew to a one-year, $5 million deal this winter. This is a drop in the bucket at this stage where it concerns MLB salaries; requiring the player to contribute less than 1.0 WAR to break even. The Yankees figured that if Drew could get a full preseason to both find his stroke and solidify his skills at second base, he might end up being serviceable. And better, if Drew could finish with a .250/.320/.420 line with 15 or more home runs from the eighth spot in the order, they would be well ahead of anything they received in 2014. Now, Drew detractors will note that Refsnyder might be a .800 OPS type of player, and it may well be true. But even the brightest young players who excel in Triple-A deal with a learning curve at the big league level. The Yankees want Refsnyder to feel completely at ease fielding his position, especially with a slew of groundball producing pitchers on the roster. By demonstrating he can field his position well, Refsnyder can gain confidence in his overall abilities and will not be learning on the job. The learning process should be handled in the minors; that’s what the lower levels of professional ball are about. So long as Drew handles his role, and there are no significant injuries around the infield causing movement of players, the Yankees will likely keep Refsnyder in Scranton/Wilkes-Barre until September. As Drew hit the go-ahead grand slam, his second home run of the season, he might have gained a better grip on his roster spot. The Yankees see he has the potential to be the player he was as recently as 2013, and fans, at least for a day or two, can cut him some slack. But a patient stance by the Yankees is logical as well. Beyond Drew receiving the right number of reps during Spring Training, he has proven to be a better hitter as the season wears on. His career splits, including his atrocious 2014 season, show a player who hits his stride in the second half of the season. At 32, Drew has passed his prime. To expect the exact results is not fair. However, to believe that he can produce a .740 OPS across 600+ plate appearances with better than average defense makes him a valuable holdover until Refsnyder proves he can handle the position. The Yankees can be patient, but must be ready to take action if the plan is faltering. I’ve argued that Drew cannot be given much more than 200 plate appearances where he is producing a sub .600 OPS. If that comes to fruition, the Yanks will have to take a step back and ponder whether Drew might in fact be in a full throttle decline. At that point looking to Refsnyder, Jose Pirela or someone else via trade might be a necessity. But, Drew has just 23 plate appearances under his belt and a .190/.217/.476 line to show for it. Expect the average and on-base percentage to climb gradually and the slugging percentage to drop slightly. Maybe he sits with a .700 OPS for the first month or two and then pushes it to a .740 OPS overall by October is not out of the question based on his historical trends. Pinch-hit grand slams go a long way toward building confidence and extending a team's proverbial rope. Drew should feel secure in his abilities, and the Yankees will certainly remain patient believing in a rebound of them. Christopher Carelli is a freelance baseball writer. Besides his work here, Christopher is a correspondent for FantasyPros, where he writes a weekly column covering the closer/bullpen situations around Major League Baseball. His baseball commentary has also been published on Yahoo Sports, the FanSided network, Sportsideo and linked multiple times on MLB Trade Rumors’ Baseball Blogs Weigh In. He is a member of the Internet Baseball Writers Association of America, the Baseball Bloggers Alliance and the BYB Hub.